Whatsapp is currently testing a new feature that lets you Pin a chat; just like pinning a particular post on a Facebook group. This feature will be useful if you have an important chat that you wouldn't want to keep scrolling to find. Pinning a chat on Whatsapp will get the chat to stick at the top above regular chats. Currently, this feature is not available on the regular Whatsapp version on Playstore; it's in Beta testing now, which is currently available in the beta version (2.17.162 or 163) of the app. Latest Whatsapp Beta version now lets you pin a maximum of 3 chats. If you try pinning a fourth chat, the app will display an error. We expect Whatsapp to add this feature to the regular app on Playstore soon or later. If you feel impatient and would like to join the Whatsapp Beta testers, then, read on. ==> Open your Playstore app and search for Whatsapp. ==> Tap on the app. ==> In a few minutes you'll be offered an update (on that same page) to the latest Whatsapp beta, which should have all of the above features in it. That's all friends. I hope you loved this post? Kindly comment and share this post by clicking the share buttons below. You can now Pin chat on Whatsapp. 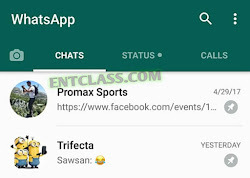 Download latest version of Whatsapp that Pin chat. Whatsapp Pin chat. Whatsapp is getting cool and awesome feature day by day, we appreciated this wonderful development. Cool. I was thinking it was pin of something like bbm. That will just be the beginning of the end for them.